Image capture from video on Iwantv. I will admit from the off that I am not a fan of The Voice Kids. I only saw tidbits while channel hopping last season and that is how it has also been this season. While I am not a singer, I do have sharp ears and few things annoy them more than notes sung out of tune. Perhaps, the reason why I did not really watch the show was because I did not expect kids to have as much control over their voices as older singers. That thinking was seriously challenged last night while I was charging my wireless headset to watch downloaded shows and chanced upon these three kids from Team Lea battling it out for a place in the next round. I stayed. I thought each of the three kids had better control and voice quality than the Season One winner and that it was unfortunate that only one could go through. As things would have it, I received special motivation to keep watching because there were also two Batangueño kids in the next battle between singers from Team Bamboo. One of these, eleven year old Benedict Inciong, I was familiar with. Not personally, do not anyone get me wrong. His blind audition was plastered all over the Facebook Newsfeed after he won through and I also remembered him from a regional TV Patrol clip. It was not so much Benedict himself but rather something his Mom said during the interview with the news crew that made me remember him. With refreshing candour, his Mom told the news crew that they were actually discouraging him from auditioning because they thought other contestants were getting training and were therefore so much better. Besides, she added cheekily, she told Benedict that his voice was more pang-baño (for the bathroom). If you are not from hereabouts, you may think that that was a shocking put-down from the kid’s own mother. However, that was just typically cheeky if pragmatic Batangueño humour and I, for one, could not stop laughing. The mother’s support, indeed, we saw last night. While Benedict has been introduced as from Batangas, he is to be more specific from Lipa. He actually lives five minutes away from where I do, in a village called New York. Kidding! The village is really called Bagong Pook but as you can surmise, New York is how locals sometimes refer to it in jest. In fact, it is really a small world and I found out last night on Facebook that the boy is the nephew of one of my former co-workers. Watching the video of his blind audition, I immediately understood why both Bamboo and Lea Salonga turned around for him. There was a silky if raw quality to his voice that obviously any of the three coaches would be able to refine. My main concern was his diction as obviously he is from Batangas, which linguists think of as home of the Tagalog language. What I am trying to say is that Tagalog in its purest form does not really have room for f and v and Benedict seemed to be one of countless kids from hereabouts for whom 54 is pipti-por or even pibti-por. Of course Bamboo and members of the production staff must have been working overtime off-cam because last night, singing Owl City’s ‘Fireflies’ with Sim Teves and fellow Batangueño Christian Pasno, Benedict’s diction had improved by leaps and bounds. 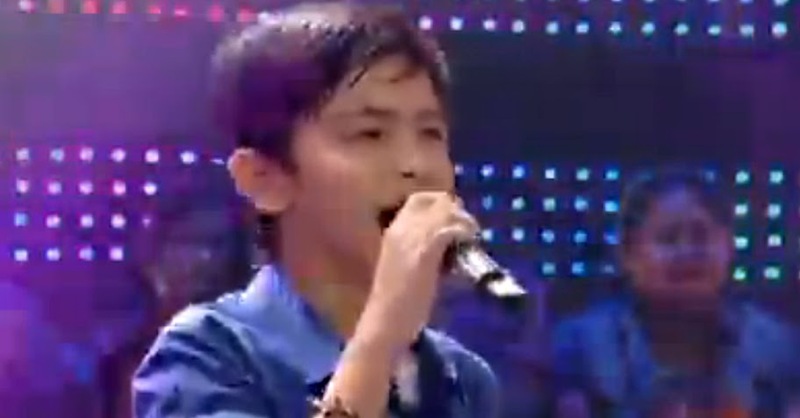 Of the three kids, on the basis of voice quality alone, perhaps Sim Teves should have won through. However, the young girl looked unsure of herself at times and not just a tad overawed by the occasion. That the lass has a singing career ahead of her, however, is not difficult to imagine. In contrast, Benedict was brave and performed with real Batangueño swagger; and not that there was really a wide chasm between the quality of his voice and that of Sim. The boy is also blessed with good looks; and this is showbiz, after all. It does not harm anyone’s chances to look good on top of sounding good. I just felt a wee bit sorry for little Christian Pasno, who would have made as worthy a winner as Benedict last night. The boy probably needed a bit more of self-confidence but he could also sing! It was probably just unfortunate that he had to be in the same round with Benedict. Meanwhile, this round was Benedict’s, won for his home city of Lipa and home province of Batangas. I do not as yet see a Darren Espanto in him but if there is one thing of note about being so young, it is that one is still very malleable. Bamboo is due a win in the talent search so should be really motivated. That it will be with Benedict that Bamboo finally gets his win, I guess we all have to wait to find out. And this probably means that I have to watch more of the show.